This trip is well suited to those who are lightly packed and don’t mind working harder than most. The reward is a very lovely, little traveled, high quality Wilderness route. These small lakes have some of the highest elevations in Minnesota and harbor a wide variety of wildlife. Cross Sawbill to the easy Alton portage. In the northwest corner of Alton you will find the short Kelso portage. You will notice how wide the trail is on these two portages. These portages once had hand operated, narrow gauge railroads on them. The tracks were installed to haul loads of steel which were used to build a lookout tower on Kelso Mountain just West of Kelso Lake. The railway was used by canoeists for many years. They could float their loaded canoes onto the hand car, which ran on tracks extending out over the water. Canoeists would pull the whole load across and float it off on the other side. The railroad and lookout tower have been gone for many years now. Fire patrol is now accomplished by airplane. The Forest Service’s antique DeHavilland Beavers are the only planes allowed to fly lower than 5000 feet over the Wilderness. After paddling up Kelso Lake, you enter the beautiful floating bog of the Kelso River. Just before you get to Lujenida Lake, watch on your right for a large boulder, perched on three smaller rocks, square on top of a small, bald island. Some experts believe this is a dolmen, placed deliberately by Vikings in the fifth century as a navigational aid. These experts believe the Vikings were searching for gold and found their way all the way to Lujenida Lake. Other experts think the mysterious rock formation is just a glacial erratic that chanced to land in this unusual spot when the ice subsided about 10,000 years ago. Who knows?! The 480-rod Lujenida to Zenith portage is just ahead. 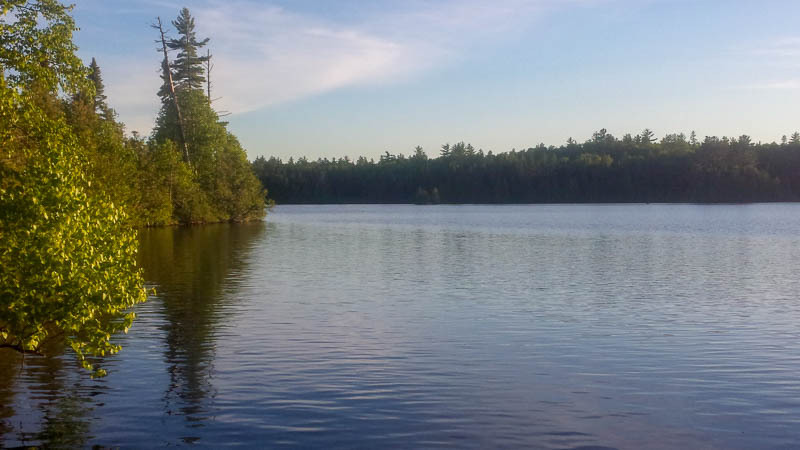 In the very narrow flowage between Zenith and Frederick Lakes you are likely to spot a Great Blue Heron or an American Bittern, both large, stork-like birds. Camp on Frederick or push on to Wine. If you are fishing, throw a small shiny spoon into Wine. The best spot is right out in the middle, directly in front of the portage. Large lake trout lurk near the bottom. The portages on this part of the route are rough and rocky. 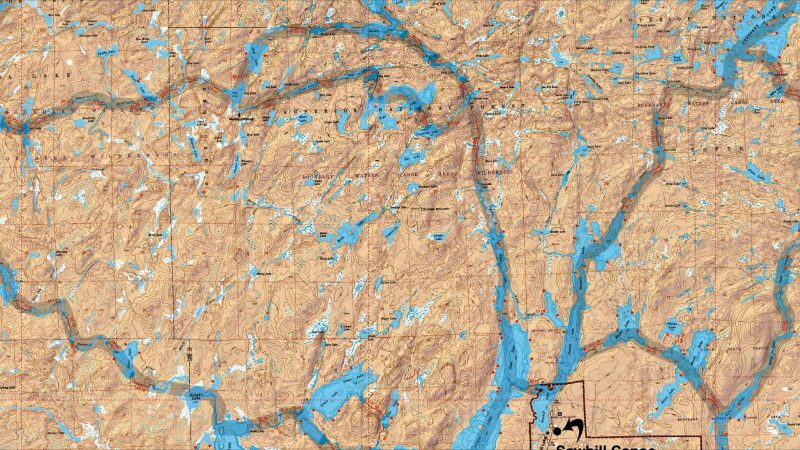 Mug, Poe, and Louse Lakes are surrounded by exposed swatches of the world’s oldest rock. Bug Lake is only a few feet deep and full of minnows. Watch for kingfishers diving from overhanging trees into the water. Dent Lake is over 70 feet deep and is rumored to have been stocked with lake trout. Three more steep and rugged portages bring this tiring day to a close on Mesaba Lake. A short bushwhack into Leah Lake makes makes a good after-dinner outing. Paddle through Hug and Duck Lakes back to Zenith. This is prime moose watching country. See if you can find the wrecked airplane on the shore of Zenith Lake. A poacher crashed here just after WW II on Christmas Eve. He reportedly walked all the way to Tofte through knee deep snow wearing only street shoes. Now it’s back over the long portage to your last camp on Kelso Lake. Small northerns are abundant in Kelso.